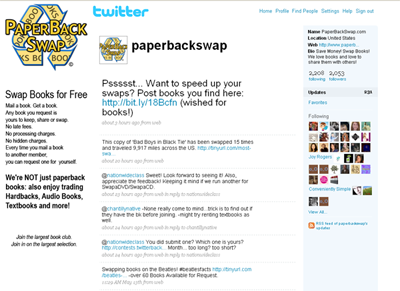 PaperBackSwap.com is holding a Twitter Background Design Contest for their Twitter Profile @paperbackswap. We wanted to give our talented members a chance to get involved in representing our company. What better way than with a Twitter Background Design Contest! Beginning May 7th! Go to TwitterBackgroundsGallery.com to submit your design. A huge thanks to TwitterBackgroundsGallery.com for helping us set this up & use their website to run the contest. *Please Note: After submitting your design please keep your original files safe and secure. The winners will need to send the original files to PaperBackSwap for use. We will contact the winners with details. Who will be judging the contest? “People’s Choice” -You all will choose 5. “Our Choice” – The PBS Team will choose 5. Prizes will be offered to the top 10 designs! The top 10 designs will be rotated on the PaperbackSwap Twitter Profile (@paperbackswap) throughout the next 2 years. The top 10 entries will be featured in the PaperbackSwap.com twitter profile, newsletter & blog. We must receive your files and they must be usable. *See note above. Professional, Creative, Family-Friendly designs only please. By submitting your design, you release your rights & give PaperbackSwap.com full use of the design. The Public / PaperbackSwap.com team will decide which designs are best. We reserve the right to make changes to the contest at any time. Multiple Monitor resolutions will be viewing the backgrounds. must be up-loadable to twitter… test on your twitter profile first. The more the merrier! Please help spread the word via your blogs, facebook, myspace, blogs, drop a flyer by an art class, etc. For Twitter use the hashtag #pbs_twitter when tweeting about this competition. Retweeting the tweets of @paperbackswap about this competition will be really helpful too! I’m sure questions will come up during the competition and we’ll try our best to address them as quickly as possible via Twitter and the PaperBackSwap.com Blog. This entry was posted on Thursday, May 7th, 2009 at 7:47 pm	and is filed under Contests. You can follow any responses to this entry through the RSS 2.0 feed. You can leave a response, or trackback from your own site. Hi I submitted two different designs, but neither of them have appeared for voting. When I submitted them twitter said they were waiting for moderation. What does this mean, and how long does this process take? Hi Booklover1335! First of all, thanks for submitting your designs! Thanks again & Good Luck! Just wanted to say I submitted an entry.. (a little late) for the Twitter Contest. I am already anxious for Sunday! I cannot wait to see who wins! Of course I would LOVE to win but there are some really amazing entries there already. I haven’t done any playing around in graphics like I used to so this was fun to pull out my dusty Paint shop pro program again, almost forgot how to use it. anyway, Thank you for the opportunity and I have my fingers crossed (Subliminal messages: Pick BurtonReview Pick Burtonreview!) THANKS! When does the voting for the backgrounds end? I have the same question..because even though on the front page it says that The Contest is Closed, the voting is still occurring, just in case you were not aware. First of all, thanks for submitting your designs and voting! We’ve got a list that we think are the winners, I’m just verifying that w/ TBG admin. We should have an official announcement of the People’s Choice Winners by later today. We should also be able to announce the PBS Teams Choice @ the same time, tomorrow @ the latest. Just curious… when will you guys will be closing down the voting on the TBG contest page, since voting is still going on?